The Gemini Giant is a landmark statue on U.S. Route 66 at the Eastern entrance to Wilmington, Will County, Illinois. It is a 30ft statue standing guard over the Launching Pad Drive-In restaurant. The Giant is “Muffler Man” but changes it up with a sassy astronaut helmet and silver rocket. If you visit the Giant while the Launching Pad is open, buy a commemorative T-shirt with the Giant’s face on it. It is the most photographed “citizen” but it isn’t a person at all. 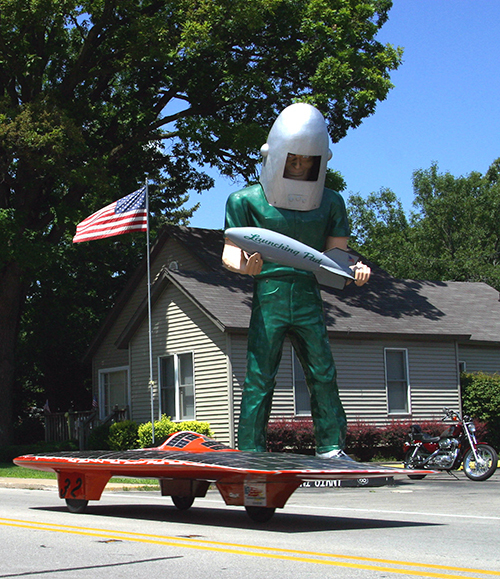 Rather it is the Gemini Giant, a large fiberglass “muffler man” of the 1960’s era. 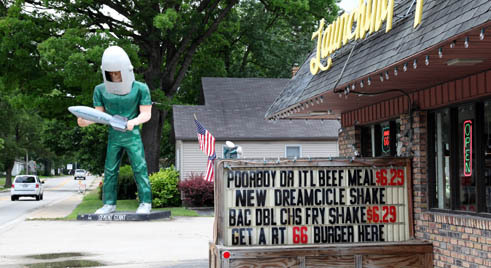 The green astronaut “Gemini Giant” in Wilmington announcing the “Launching Pad” fast food and “Tall Paul, “probably the first Muffler Men in history in Atlanta.